Welcome to the official website of David Young, author of the Karin Müller series of crime thrillers set in East Germany in the mid 1970s. The series is published by Bonnier Zaffre in the UK and by publishers in ten other international territories. It begins in 1975 with Stasi Child, David's critically-acclaimed debut which was an official Top Twenty paperback bestseller in The Bookseller, won the CWA Endeavour Historical Dagger for best historical crime novel of 2016, and was longlisted for the Theakstons Old Peculier Crime Novel of the Year. The second in the series, Stasi Wolf, was published in e-book and paperback in February 2017. 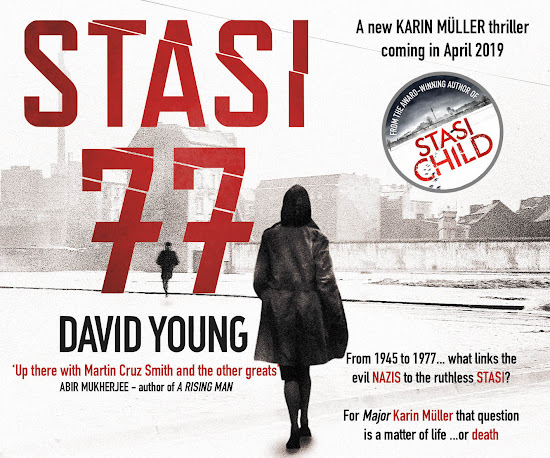 A Darker State followed in 2018 and the fourth in the series, Stasi 77, is due on April 18th 2019 in the UK. David has just completed a draft of the fifth book, provisionally titled Stasi Winter. Its UK publication is likely to be in 2020. DAVID YOUNG was born near Hull and, after dropping out of a Bristol University science degree, studied Humanities at Bristol Polytechnic. Temporary jobs cleaning ferry toilets and driving a butcher’s van were followed by a career in journalism on provincial newspapers, a London news agency, and international radio and TV newsrooms. He now writes in his garden shed and in a caravan on the Isle of Wight, and in his spare time supports Hull City AFC.